ohhhhh when it is hot out like it is today my drink of choice is lemonade! Santa Cruz Organic Lemonade is definitely one of my top favs and I absolutely love all the flavors they carry! Cherry, Mango, Peach, Raspberry, Strawberry and original Lemonade. And if you didn’t think they could get any more exciting you are wrong. They sent me a tray of ice cube molds and I added fresh raspberries and blueberries to the water and stuck them in the freezer. What a fabulous idea to have real icy fruit added to my lemonade. I love sitting out on my back patio with a glass! 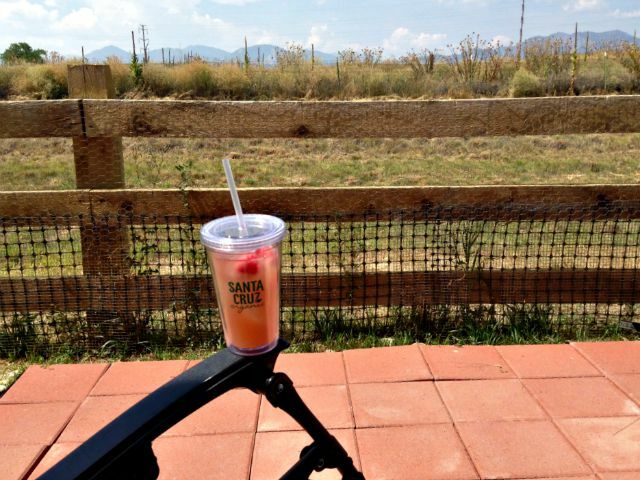 Santa Cruz Organic Lemonades are guaranteed to be organic (look for the seal! ), from the ingredients through the recipe-batching process, and into the bottle. This assures product integrity and supports efforts for environmental responsibility which is very important to all of us. Even my boys ask for lemonade first to drink and I buy it year round to include in their lunch thermos. Water bottles are definitely great for throughout the day, but they love having a sweet treat at noon. Santa Cruz Organic has the best lemonades around! Visit SantaCruzOrganic.com for all their products! You can buy the lemonade on Amazon! 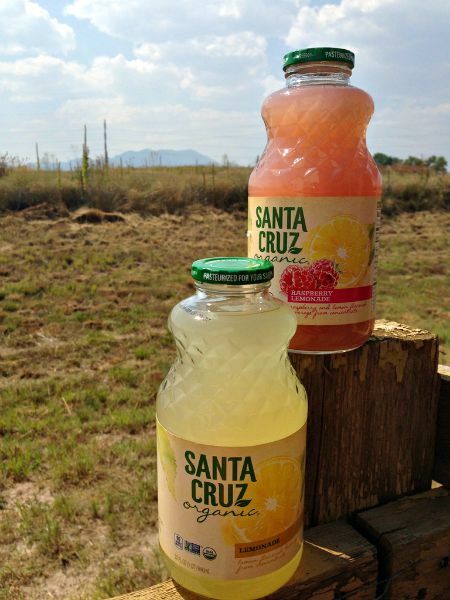 WIN 2 bottles of Santa Cruz Organic Lemonade! The product has been provided by Santa Cruz so I could experience it with my family and the thoughts and opinions are all my own. Links may be affiliate. OraMd Natural Liquid Tooth Cleaner Giveaway – 3 Winners! I sometimes ad something to my lemonade, when I was a teenager my girlfriend would pop corn and we would have lemonade with cherries in it. Even the memory is wonderful. I like raspberries in my lemonade too. We don't usually have lemonade of any kind at our house except on special occasions. We just can't afford it, but we do love it!! We drink a lot of pink lemonade at our house. Thanks for the giveaway. I love lemonade! Especially cherry lemonade! Strawberry lemonade is my favorite. Strawberry lemonade is our favorite. We love,love,love lemonade.there are so very many different flavors to infuse.thanks so much for sharing. We don't drink too much lemonade but we love most flavors! We usually drink strawberry lemonade at our house. At our house, we drink all kinds of flavored lemonade but our favorite is regular. We love all lemonade, but raspberry lemonade is a family favorite. We love raspberry and strawberry flavored lemonades!!! I would love to try the Raspberry Lemonade. The flavors all sound so refreshing. Thank you for the review! We love flavored lemonade! We love strawberry, cherry, raspberry, minty lemonades! I like the half tea & half lemonade mixture. I love to make homemade lemonade and limeade to drink at home. I cannot drink lemonade, but my grandchildren do!! Usually we have lemonade. The mango lemonade sounds terrific! I love homemade lavender lemonade! We love strawberry lemonade, I would love to try the raspberry one! I love all lemonade, flavored and not. Growing up, Mama made us lemonade on hot summer days. It was great, and I still love it. With these new flavors added, we can now enjoy a different flavor every day and never get tired of it. It really perks up the days. I love that they have such a large selection of flavors, I'd love to try the mango and the strawberry. We love strawberry lemonade when we are looking for a change! I do like flavored lemonade and regular lemonade too. I don't, but would love to try something new. My kids really like strawberry lemonade. I have never tried this brand, but I would love to. Thank you. I love original lemonade. I would love to try the Strawberry flavor. We love lemonade, we like to make strawberry lemonade. We do drink flavored lemonade from time to time, but we really prefer "natural" lemonade. Sometimes we add strawberries to the lemonade. I have never had flavored lemonade. We have only tried plain lemonade here. I would love to try a flavored lemonade. My husband usually likes the half and half Arizona half iced tea half lemonade it's his favorite. I wouldn't mind trying the Mango I love Mango flavored drinks so delicious and refreshing. I make regular when we do make it I have a lemon tree in my yard. We like any type of lemonade at our house. I love lemonade! I mix it with iced tea for a healthier drink with less calories! I like strawberry lemonade but usually buy any. We frequently drink flavored lemonade!! Its great to change it up from plain water sometimes... definitely gives me more incentive to stay hydrated! lol! No, I have not had flavored lemonade at my home. We love Strawberry Lemonade with fresh strawberries! Just plain lemonade so far. We love all of the different flavors of lemonade. Regular, pink, raspberry, strawberry, blueberry, you name it! Lemonade is such an awesome and refreshing summer drink! I love flavored lemonade. We usually drink mango lemonade. We love making and drinking some raspberry lemonade! I like lemonade and I enjoy lemon tea a lot.